On the cover there is this flying elephant. India has often been characterized by the ‘Elephant’ vis-à-vis ‘Dragon’ for China. India’s evolving socio-economic profile, coupled with expectations of revival, can create niche opportunities for businesses worldwide. 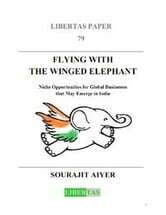 They can boost growth and help the elephant to race ahead, hence the usage of ‘Wings’. The usage of ‘Flying’ is to convey to global businesses that they could benefit from this growth, by actively partnering in these opportunities. 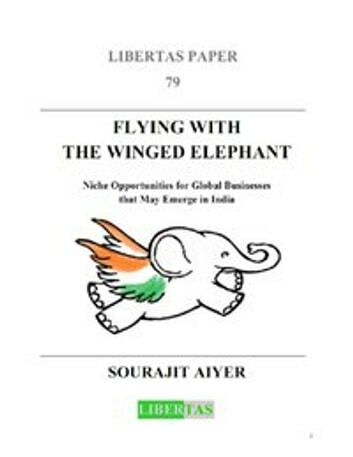 This is the content of this book by Sourajit Aiyer, a financial expert from Mumbai/India. One should also bear in mind that the language of business in India is English, and it is spoken across strata of population. The legal system is largely based on the British common-law, a result of its colonial heritage. For global businesses, these aspects might make India relatively easier to navigate, as compared to others in the emerging economy universe. Knowledge First - this corporate mantra has to be recalled by every reader who should read this paper openly and intelligently. Based on an appeal by an Indian politician, that the 21st century could be India's, he recalls that whenever the world had moved into periods of knowledge throughout its history, India had played a leading role through its contributions in sciences, mathematics and economics. The 21st century is the century of knowledge. Only when the knowledge is conveyed to potential partners, can it be utilized. The purpose behind this exercise is to identify some of the niche opportunities that might emerge in an evolving and reviving India. For global businesses, the benefits might include increased demand for their specialized services, investments into high-growth pools of opportunity in India, demand for intellectual capital and manufactured inputs, ability to develop products more relevant for India’s cultural specificities, etc., and for India, the benefits might include business and income opportunities, creation of future assets to assist its growth story, deepening of domestic and export capabilities, and a fill-up to overall employment and entrepreneurship. Employment is a necessity in India – given the virtuous circle between income, demand, supply and growth. Some of the opportunities mentioned are conventional ideas, but some might be unconventional, but not unreasonable. Many ideas relate to European and North American small businesses, but it is these very small businesses that can become large in a growth economy and help expand and diversify the corporate base. India’s journey following the 1990s reforms saw several such examples. Indian businesses themselves have matured, and can be useful partners. The recent slowdown made them more adaptable.